The file to tape job detects files that match the job criteria. If it is a first job run or a scheduled full backup, all selected files are queued for archiving. If it is an incremental backup run, Veeam Backup & Replication addresses the Tape Catalog in the Veeam Backup & Replication database to detect if any data has been modified since the latest backup. Detected changes are queued for archiving. 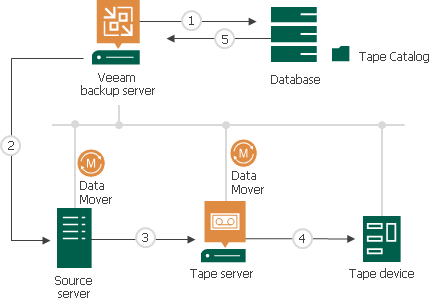 Veeam Backup & Replication connects to the Data Movers and starts the data transfer process. The source Data Mover retrieves data from the source servers and target Data Mover sends data to tape. While tape recording is performed, Veeam Backup service updates data in the Tape Catalog in Veeam Backup database. The Veeam Backup console displays refreshed information about files archived to tape and shows job statistics.